Charlie Allnut: How'd you like it? Rose Sayer: Like it? Charlie Allnut: White water rapids! 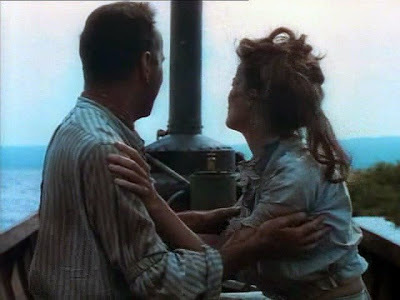 Rose Sayer: I never dreamed... Charlie Allnut: I don't blame you for being scared - not one bit. Nobody with good sense ain't scared of white water... Rose Sayer: I never dreamed that any mere physical experience could be so stimulating! 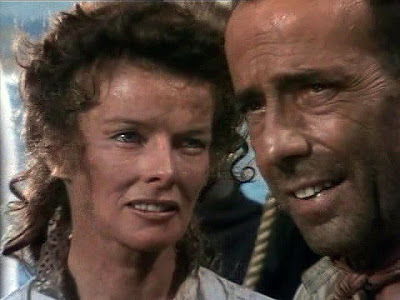 As a film buff who has seen a whole host of variations on this timeworn story played out in many more recent adventure films, like Romancing the Stone (1984), Medicine Man (1992), Six Days Seven Nights (1998), etc., it is exciting to see a film couple that doesn't banter unnecessarily in order for the director to keep the sexual tension ratcheted up. Allnut and Rose slowly find common ground and fall quite charmingly in love with each other. And their happiness is infectious to anyone who watches the film. Huston's film is important in some significant ways. Like their characters, Bogart (Casablanca) and Hepburn (The Philadelphia Story) made for an unusual but effective screen couple, their incongruous acting styles contributing to the romantic chemistry. 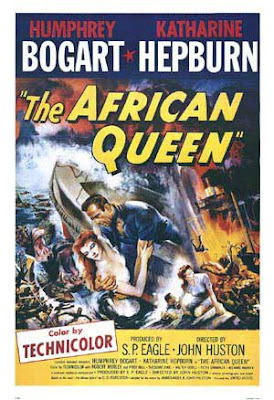 Also, it was the rare movie in those days that got to shoot on location, and Huston (The Treasure of the Sierra Madre) travelled to Africa to add authenticity to its aesthetic, an account of this being the basis for Peter Viertel's novel, White Hunter, Black Heart, and its eventual Clint Eastwood-directed 1990 film adaptation. Marking the first time either star would appear in a color film, the Technicolor cinematography is executed by the renowned Jack Cardiff (Black Narcissus). Cardiff's photography enhances this enjoyable romp, as one can observe from even these less than stellar screen captures. Cardiff, who so effectively pushed the boundaries of color cinema in his collaborations with the Powell and Pressburger team (A Matter of Life and Death, The Red Shoes), captured the inherent dichotomy of the dark continent in his mysterious yet alluring lighting and framing design. 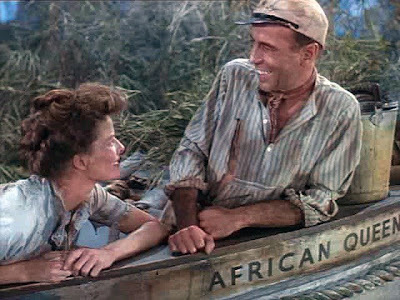 The African Queen is amongst his most visually attractive films in a career that spans the range of film history, from silent film to today. 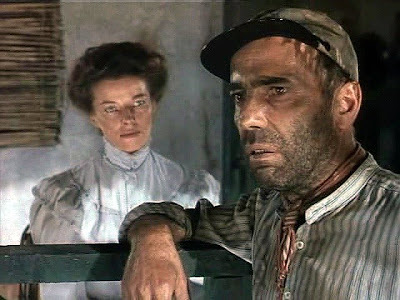 For Huston and Bogart, who had collaborated on some of their best films together starting with The Maltese Falcon (1941), this would be their last film together. The film would prove to be a vindication of sorts for Bogart, who was often underestimated as an actor. 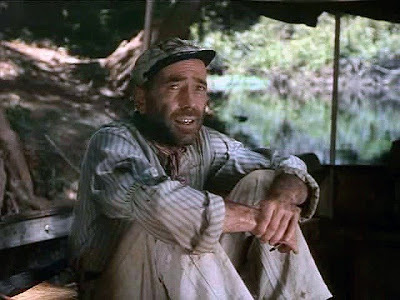 He would win his only Oscar for the role of Allnut, a role that had to be modified from its depiction as an Englishman, in the original novel, to a Canadian because Bogart had trouble pulling off the accent. While I'm not sure it was entirely deserved in a year where he competed against Marlon Brando (A Streetcar Named Desire), Montgomery Clift (A Place in the Sun) and Fredric March (Death of a Salesman), all arguably better performances, the role is easily Bogart's career best. Stealing the show throughout is no easy feat when acting opposite the actress with the most Oscar wins in history. 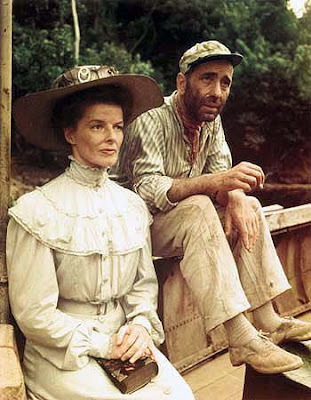 As of 2003, according to the Home Theater Forum, The African Queen has yet to be released on DVD in Region 1 because of issues with the rights, even though Paramount seems to be the leading contender in regards to releasing it. Apparently restoration work is rumored to have begun, which hopefully means that a pristine version is forthcoming sooner rather than not. My name is Paula Bettencourt. Thnk you fore recognizing this timeless classic. 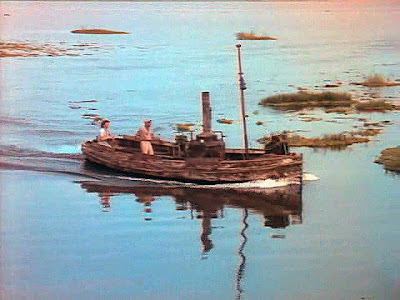 I'm also hoping fore the African queen to be restored and released in reion 1 DVD. I've also heard the rumor that it is supposed to be being planned fore region 1 release. I certainly hope that this is true.